Fowler Law students have numerous opportunities to receive recognition for accomplishments achieved during law school. Awards are given for excellence in academics and scholarship, as well as professionalism, advocacy and other areas of note. Students may also choose to pursue one of Fowler's many emphasis programs, providing a prestigious certificate upon completion. Graduation honors are typically awarded based on recommendations by the Fowler Law dean and faculty. Other awards are determined based on excellence in writing, advocacy, leadership, or first year competitions. Certificates are awarded based on completion of stringent program requirements. 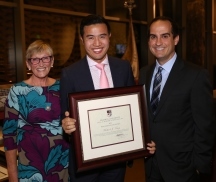 Presented annually by the dean to the graduating student whose leadership and service to the law school and its students represent a significant contribution to the development of Chapman University Fowler School of Law. Presented annually by the dean and faculty to the graduating student who has achieved the highest grade point average in the graduating class. Presented annually by the dean and faculty to the graduating student whose scholarship, ethics and service exemplify the highest ideals of the legal profession. Presented annually by the dean and faculty to the graduating student who has represented the law school to the legal profession and to the larger community in a distinctively significant manner. Selected annually by the dean and faculty and presented by the National Association of Women Lawyers to the graduating student who contributes to the advancement of women in society; promotes issues and concerns of women in the legal profession; exhibits motivation, tenacity and enthusiasm; demonstrates academic achievement; and has earned the respect of the dean and faculty of the law school. Presented annually by the American Society of Legal Writers to five (5) graduating student selected by the Faculty who demonstrate the highest levels of professionalism and who are outstanding legal writers. Selected annually by the dean and faculty and presented to the graduate who best represents a combination of scholarship and leadership, the qualities embodied by the ALI-ABA parent organizations, the American Law Institute and the American Bar Association. Presented annually to graduating students who have completed 50 or more hours of pro bono legal service in non-profit organizations or governmental entities other than courts. The Golden Quill Award is presented annually to students whose briefs are selected as the "Top Briefs" for the plaintiff and the defendant in the first year students' Legal Research and Writing Competition. The Golden Gavel award is given annually to students who are selected the "Best Oralists" for the plaintiff and the defendant in the first year students' Oral Argument Competition.